Aura Vent with a Curb Mount Flange is easily installed onto a roof curb as an exhaust roof vent. Aura Vents are a Flexible and Effective Exhaust Roof Vent. Pictured here, installed on a pitched roof. Our vent product lines make excellent exhaust roof vents: Aura Vents, Round Back Vents, Keepa Vents, Pop Vents, and Universal Vents. We also make Round Back Roof Jack Vent Caps and Keepa Roof Jack Vent Caps which include tailpipes to easily attach to duct work to ventilate bathrooms, dryers, or other specialized roof ventilation applications. Hot air rises. With adequate intake ventilation and a vent near the top of an attic space, warmer and wetter air will find its way out of the attic. We are roof vent specialists, and many of our vent products make ideal exhaust vents for a wide variety of attic ventilation applications. All our exhaust roof vents effectively remove heat from under the roof directly to the outside on hot summer days and removes moisture from the attic on cold damp nights. 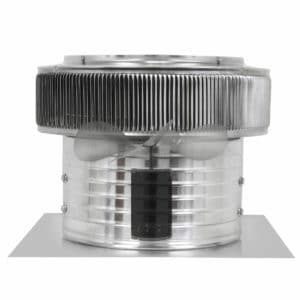 Our roof vents are also available with Curb Mount Flanges, designed to install on top of a roof curb: Aura Vents with Curb Mount Flange, Round Back Vents with Curb Mount Flange. Our Intake Pop Vent – Here a PV-20-C12. Group of soffit vents, width of 10in. Ventilation must be balanced, or air will not move. Exhaust roof vents are only half the picture. Intake roof vents are generally used to bring in cool, dry air near the lowest point of an attic. This creates an air flow. Gravity causes the warmer air to rise, expelling the wetter air out of the exhaust roof vents near the top of the roof. Our Vent Calculator is the perfect tool to determine the number of intake and exhaust roof vents needed. Our intake roof vents include Round Back Vents, Keepa Vents, Pop Roof Vents, Universal Vents, and Soffit Vents. Our Aura Attic Fans (Sometimes referred to as “Power Vents“) use powerful fans to keep your attic ventilated in any season, day and night. 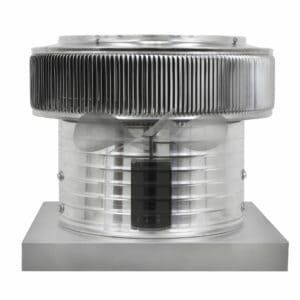 Our Aura vent head, used in our Aura Attic Fans, actively exhaust even when the fan is not turned on, due to the unique shape of the Aura vent head louver design. Even a small breeze is enough to activate the venturi effect, which creates a suction to draw air up and through the vent head. Aura Solar Fan 12 inch, powder coated brown, installed on a shingled pitched roof. 8 inch Round Back Solar Fan powder coated black, installed on a shingled pitched roof. 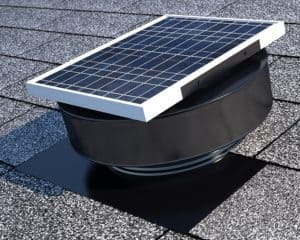 The Aura Solar Attic Fan (Sometimes referred to as a “Solar Power Vent“) uses both solar and wind power for optimum ventilation performance, day and night. Aura Solar Attic Fans are also available with Curb Mount Flanges, ready to install on roof curbs. We also sell Round Back Solar Fans. Our Company Focus is Roof Vents and Roofing Ventilation. Over 21 years experience using the forces of nature to help you ventilate. The following pages explain some ventilation systems, where all the components balance with each other, keeping attic spaces cool in the summer, dry in the winter. Here is an article of a nearby installation of over 100 of our roof vents for a large commercial complex. This installation had pre-installed wooden roof curbs. This Pop Vent was installed in just a few minutes and this was done right before a major rainstorm. Roof Ventilation – Air Exhaust Vents for Steep Slope Roofs. All roof vents effectively remove heat from under the roof directly to the outside on hot summer days and removes moisture from the attic on cold damp nights. All roof vents carry Florida State Approval, California Wild File Certification, TDI, IBC Compliance and more. These roof vents will exceed your expectations. Attic Ventilation – Air Exhaust Vents for Low Slope & Flat Roofs. Roof vents range in size from 3 inch to 48 inches in diameter, & collar heights (the neck of the vents) range from 1 inch to 36 inches in height. Roof vents are manufactured and engineered for every climate zone. Our Roof Jacks are excellent for venting out a bathroom fan or other duct applications. Made of rust free aluminum, with a 2 inch tail pipe (adapter) to fit existing duct work. The inner vertical louvers of the roof vents act as an insect screen, keeping out wildlife while allowing air to flow without resistance. Its superior design also rain and snow from entering, as the top is not open to the sky. Having a round design makes the vent aerodynamic, which allows it to deflect wind an objects carried by the wind. The low profile and round design of the residential roof jack vent cap is appealing to the eye and with various color options your home will look beautiful. The commercial roof jack vent cap has a standard 11 in. collar height, great for a flat roof install, especially in areas with high rain or snow fall. Roof Ventilation – Air Intake Vents or Air Exhaust Vents. The Universal Vent, a low profile off ridge roof vent, designed for steep sloped roofs that can be used for air intake vent and or exhaust. This design looks great on a shingle roof & it can also be used on a a parapet wall that surrounds a flat roof. When used as an exhaust vent, it allows heat and moisture to escape on the upper portion of the roof, & when placed at the low portion of the roof, it can be used as an air intake vent, similar to a soffit vent. Attic Ventilation – Air Intake Vents for Low Slope & Flat Roofs. In order to exhaust air, you need intake air! Our line of intake roof vents allow your exhaust vents to work efficiently, by bringing in fresh air as your exhaust releases the hot air. All aluminum construction, these intake vents are maintenance free and will not rust! UL certified and tested to withstand wind pressure speeds up to 200 mph. 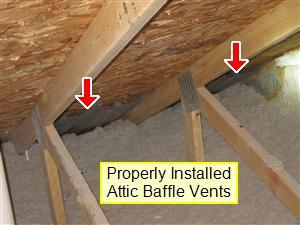 Attic Ventilation – Air Intake Vents Under the Eaves. 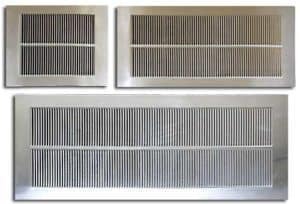 Our Soffit Vents are corrosion resistant because of its all aluminum construction. It is rust free and very durable (22 gauge – 0.025″ inch aluminum). The 1/8th inch opening between the louver blades will keep out insects, birds, and animals, thus allowing the air to move through the vent without resistance. Leave the old vent base on the roof & replace it with a new roof vent cap or fan. Our Retrofit Roof Vents are designed to fit on an existing base. Replace your old, worn and noisy vent heads! AVP’s all aluminum constructed Retrofit Roof Vents are silent, maintenance free and will not rust! Built to last and will fit on your existing bases. These vents exhaust heat and moisture from attic more efficiently, extending the life of your roof. Exhaust & Intake PVC Pipe Caps for Schedule 40 & Schedule 80 Pipes. Protect your PVC pipes. Used for commercial and residential applications, our PVC Vent Caps are a one piece spun lid made out of rust free aluminum. Great for exhausting gases and vapors. Its durable aluminum make can withstand harsh weather and wind forces of up to 200 mph. We have both static and solar fan varieties that will have a long lasting, clean appearance. Our Roof Exhaust Attic Fans are designed for efficiency and energy savings. Our line of Attic Fans exhaust continuously whether the electric motor is on or off. This is due to its vertical louver design, which allows air to exhaust using wind and without moving parts. Solar Powered Exhaust Fans – For releasing the summer heat. Our solar fans use both solar and wind power for maximized energy savings. Our Solar Attic Fans work under direct sunlight to exhaust heat from attic spaces during the summer. They operate very quietly and have a compact design. Solar Powered Ventilation – For Flat Roofs Needing Added Ventilation & Ducted Ventilation. Our Solar Fans are designed to exhaust hot air whether the fan is on or off because of its inner louver design. Made with rust free aluminum, we have a wide selection of diameters and collar heights to suit your needs. Our solar panels produce Cubic Feet Per Minute (CFM) at angles up to 80 degrees. AVP manufactures Mobile Home Roofing Products specifically for HUD, FEMA & Modular Builders. Dave Carter & Associates, AVP’s National Distributor has launched AVP’s money saving products to the market and as a result AVP is experiencing phenomenal growth. What is a roof vent and what is it used for? A roof vent is an engineered structure that is typically rigid and has two primary functions. First, to allow air to travel through it, and second to prevent insects, rain, snow and any wind-blown debris (including burning embers) from passing through it. Roof vents are used for the purpose of air intake and air exhaust. Having vents of both types installed is required by IBC International Building Code and all local municipalities for steep slope roofs. The goal of roof ventilation is to provide a means of allowing outside air to enter and exit attics and ventilated spaces, so that heat and moisture can leave the building envelope. What are (air) intake roof vents? Air intake vents are used to allow outside air to enter into attics. Intake vents should be located along the lowest eave or soffit of the roof assembly. Intake vents are best when used in conjunction with roof exhaust vents. In general intake vents should be designed and installed to prevent precipitation, animals and insects from entering the attic space. NRCA does not recommend the use of drip edge vents as intake vents in northern climates where there is a likelihood of ice damming. What are roof exhaust vents? Roof exhaust vents allow for hot air from the attic below to pass through them so that heat and moisture go directly to the outside, leaving the building envelope completely. In order for roof exhaust vents to work efficiently they must be located at or near the roof peak since hot air rises. What is roof ventilation (for steep slope)? Static Vents: Are roof vents that are non-motorized vents can be used as a roof exhaust vents or roof intake vents depending where on the roof they are installed. For roof exhaust they are placed near the peak of the roof and for intake they are placed on the lower portion of the roof. Read our article comparing the typical turbine vent to our Aura Ventilator! Roof Vents designed, engineered and assembled in the U.S.A.